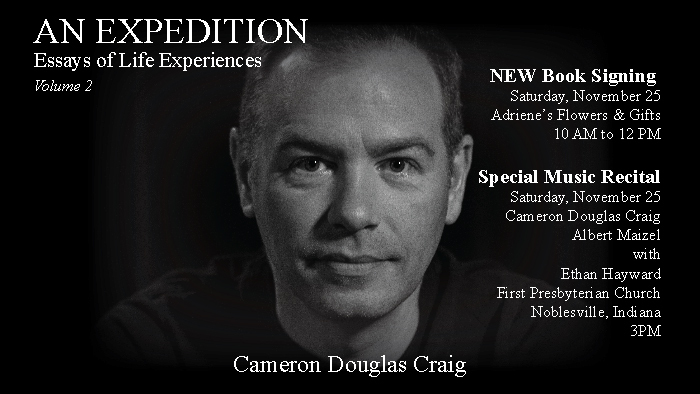 An Expedition: Essays of Life Experiences was created by Craig in 2016. The essays come from critical thoughts that encountered him or others over the years. The essays are written to get people and students to think differently about the world they live. Many of the essays are posted on Craig's Facebook page for immediate reaction and thoughtful reflection. If you would enjoy Craig's daily postings, send him a request to Cameron Douglas Craig. CDC's Personal Notes on "An Expedition"
After I published the first volume of AN EXPEDITION, I was amazed by the response from readers and listeners. I was a bit apprehensive about the publication getting into the hands of so many that would read very intimate essays about my personal world. However, that is what teachers do, sacrifice privacy for others to learn. Many of the essays from the first volume have helped individuals out with giving them a different perspective on how to think about life. My students were very attentive when I would read an essay on "Essay Monday." In fact I was extremely taken back by students wanting me to read more. There was one Monday while I was reading the essay, "A Walk in a Meadow of Iris," a student walked into class late with headphones blaring. The students already in class looked directly at him as he walked up to the back of the lecture room. "What?" he asked in bewilderment. "Do you mind?" a student retorted emphatically. I was totally amazed! I don't think I ever had an audience of college kids so mentally fixed on my words. At the end of the spring semester, 2017, a couple of months after the first volume's release, I received two hand written notes from students. The words on these hand delivered pieces of paper stated that although they enjoyed the class, they learned more about life through the essays I read in class. They went on to say that it changed a part of their thoughts about life. I never realized that my thoughts on paper would be anything but words on paper put together with a spine holding all of them together. Some of my friends jokingly said, "Volume 1? You know Cameron...He likes to dream big..." Although I planned to have the second volume published in spring 2018, my thoughts about my world has once again produced several new essays. The essays in the second volume are very dear to me because I completely open up to my reader. I take the plunge on several revelations that I believe will get students, friends, and loved ones thinking about the attitudes we believe in and the problems associated with them. Many people have asked, "Why are writing essays about people and situations that get us to think?" My answer to each of them is, "I am afraid of not remembering the people and the events in my life that made me, me." I write these essays so that if I should begin forgetting the ideas and faces I used to remember, I will have something that will possibly spark a memory from words printed on paper. My ultimate fear is never remembering the people that loved me so much throughout my life. Among the thought-provoking essays are a few new additions. I began creating a list of people I remember over the decades. The list will continue to grow with each new volume. I also included fictional stories from my mind's eye. Closing my eyes and thinking about a situation that I dreamed about became a story of love or a message to young and old alike. I am excited about the new volume that is nearly ready for release. There was a point in the summer of 2017 that I hadn't written anything and grew concerned that another volume would ever be published and my friends would be correct to joke that the first volume would be the only one. However, somehow my mind began to question things about my life experiences in the present that could possibly help others in the trek to be loved and understood. I hope you all enjoy reading the words that I print for my future and the possibility that I am lose my memory. I learn about my life through writing and I hope others join me in learning about themselves through these "Essays of LIfe Experiences."